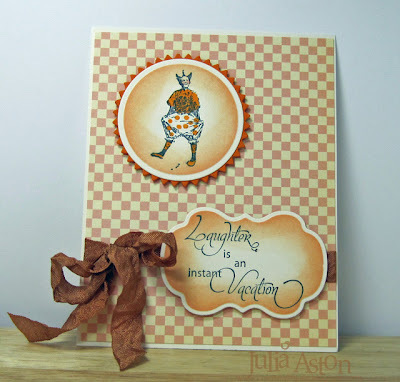 Welcome to RUBBERNECKER STAMPS release day HOP!! We are SO excited you are HOPPING with us today!! There are LOTS of AWESOME creations in store for you!! Besides ALL the GREAT creations? There are PRIZES to be had, as well!! There are THREE ways to WIN!! Take a look at what we have for you!! 1. If you leave some LOVE at EVERY stop, you could WIN…………. 2. If you sign up for the Rubbernecker Newsletter, on the RN BLOG, you could WIN…. 3. IF you “LIKE” us on Facebook, you could WIN……..
HOLY PRIZES!! WOW, can you believe ALL the chances there are to WIN? We will announce the winners THURSDAY! So, you have until then, to HOP, ”LIKE” , and SIGN-UP!! The official BLOG HOP ROUTE is listed below, in case you should get lost!! ALL of the NEW release stamps, you see today, are available NOW for purchase!! Thanks for joining in our excitement and BEST OF LUCK!! If you came here from Joan - you are in the right place! 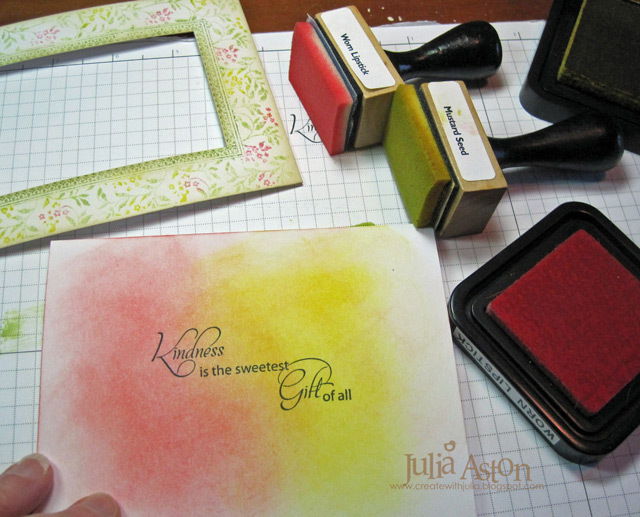 To stamp this stamp in multicolors - I made my own ink pad using a product called Cut N Dry Stamp Pad Felt by Inksentials/Ranger. I'm going to show a little tutorial with pictures of the process. 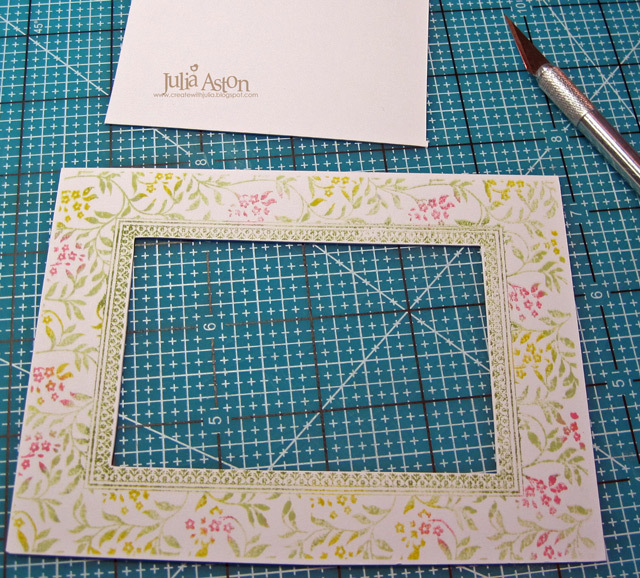 First, cut out a piece of the pad the size of your stamp. Then you stamp your stamp with black ink on the felt side of the Cut N Dry Stamp pad. 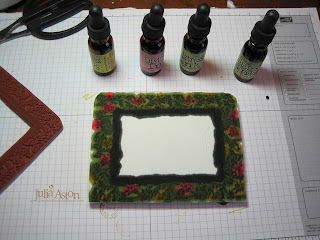 Next, you choose the Ranger Distress colors you want to use for your stamping - here I chose Ranger Distress Worn Lipstick and Mustard Seed to ink the flower portions, Shabby Shutters to ink the stems and leaves, and finally Peeled Paint to ink the inner frame . Using the eyedroppers in the reinkers - you squeeze the ink over the image portion you want that particular color - you are 'inking' your stamp pad. You will be using this as your ink pad - laying your stamp over this and pressing so the ink goes on your stamp and it allows you to have several colors on one pad. You can see how I'm inking the pad below. Here it is all inked up - Next you place your stamp on the ink pad and press being sure you are holding the stamp right side up - the same way you stamped it on the ink pad originally. (I mark my ink pad so I remember which way is up!) Then stamp the inked stamp on your paper! (just like you would when inking a stamp on a 'store bought' ink pad) and Voila! you have a multicolor stamping! Note: store your newly created ink pad in a sealable baggie and it will stay moist for quite some time - you can also reink it when it needs it following the colors you already put on. Remember to write down what color inks you use! I trimmed my stamping and then cut out the middle with my exacto knife. 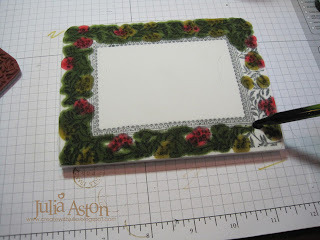 Then I outlined the cut out square on my card base - stamped my sentiment in the center of the square and then sponged it with Worn Lipstick and Mustard Seed ink to match the flowers on the frame. To finish my card - I adhered the frame to the card base with foam tape, die cut a leaf stem adhereing it to the top corner with two crocheted flowers, added bling to the sentiment and tied a piece of wrinkled seam tape around the card. Here's the blog hop route! Julia Aston - you are here! Accessories: Cut N Dry Stamp Pad Felt - Inksentials/Ranger, glue dots, Rhinestones - Kaiser, wrinkled seam tape - Prairie Bird Boutique Etsy Shop, exacto knife, Blending tool & nonstick craft mat - Ranger, Leaf stem die - Sizzix, crocheted flowers - My Minds Eye. 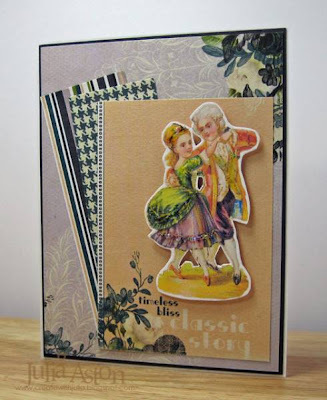 Welcome dear stampers to another Rubbernecker Stamps PREVIEW!! Rubbernecker will be releasing more NEW STAMPS on Tuesday 3/29/11. To get you ready for these BEAUTIFUL new stamps, we are having TWO days of PREVIEWS!! Welcome to DAY ONE!! 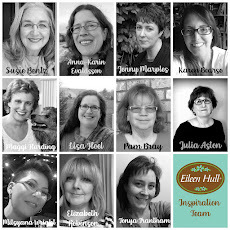 You will want to visit EVERY one of the FABULOUS design team participants and leave a comment, for on ONE of our blogs, is a chance to win a $15 Rubbernecker Stamps gift certificate! You can find the complete list of today’s participants and more ways to win on the RUBBERNECKER BLOG! Today I'm previewing one of the clowns from the Clowns + Crowns set #528 as well as a sentiment from the Garden Shrub set #560. I love this funny little vintage clown - I dotted his pants with a Copic marker as well as coloring his shirt, socks and big shoes! I thought this sentiment matched him perfectly - who doesn't laugh when they see a clown!?! I cut the sentiment with a Labels 14 Nestability and sponged it before taking it out of the die. My fun checkered paper is from October Afternoon/Modern Homemaker. The clown is cut with a circle Nestability that I again sponged before removing it from the die - then framed with a Pinking Circle Nestie. I finished off my card by tying the wrinkled seam tape ribbon around the bottom. Both the image and the sentiment are popped up on foam tape. You will find the list of all the Design Team members showing previews today on the Rubbernecker Blog! as well as details on 3 ways to win some stamps! Thanks for stopping by, hope you enjoy all of our creations and that we'll see you tomorrow for Day 2 of our previews! Don't forget to leave a comment for your chance to win! Ink: Memento Tuxedo Black, Ranger Distress - Dried Marigold. I know, I know - we are really getting ready for Spring, Easter Eggs , Daffodils and SUNSHINE!!! But Lynn has posted the March WMS Christmas Card Challenge over in the Waltzingmouse Forum - this month the challenge is to make 3 identical cards using kraft, white and red. I pulled out the wonderful Festive Foliage stamp set to make my cards this month. I just love this pine bough with the pretty pine cones. Doesn't it look great embossed in white on the red??!! I'm trying to create pretty but CAS (clean and simple) designs this year - 1) so they are easy to duplicate and 2) so they don't cost extra postage when mailing! So I kept the layers to a minimum, didn't pop anything up on foam tape and just added twine rather than some thicker bling! My Merry Christmas sentiment is from the Season's of Love-Tags set. You can read all about the monthly Christmas Card Challenges here on the WMS blog and here in the WMS forum in the Playroom. New challenges are posted on the 10th of each month! Come join in the fun and get your Christmas cards done early this year while your at it! Oh - and if you have a minute - check out my Peanut's Cards over at the PSA Stamp Camp today! Here's one of them! 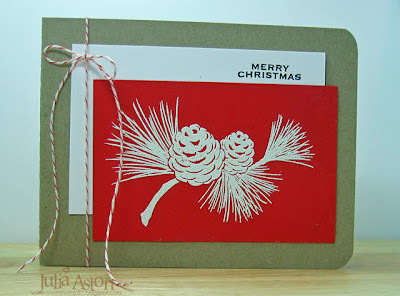 Stamps: Waltzingmouse - Festive Foliage, Merry Christmas from Seasons of Love - Tags. Ink: Versafine Onyx Black, Versamark. Accessories: Twine - PTI, white EP, hot gun, corner rounder - Zutter. Say Hello to the Craft's Meow! My good friend and former fellow WMS design team member, Lisa Hjulberg, is opening her very own Stamping Web Store today- it's called The Crafts Meow Shop. 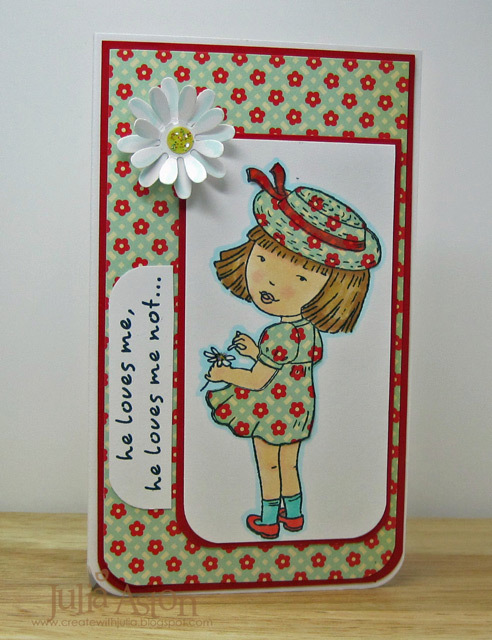 And I am thrilled to be showing you a few cards I made using several of her wonderful new stamps! This darling little girl is Frieda (named after Lisa's mother!) and this particular stamp is Little Frieda's Daisy. Since I'm not a terrific colorer - I paper pieced her dress and hat, then used Copics to color the hat ribbon, the flower, her skin, hair, socks and shoes! The daisy is a McGill punch that I layered and put a yellow circle and stickles in the center. I used the sketch from this weeks Get Sketchy challenge and this also qualifies for the Stamp Something Challenge - to stamp something sweet - I think this little Frieda is pretty sweet don't you?! 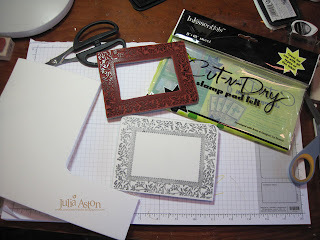 And the CRAFT challenge is to paper piece! 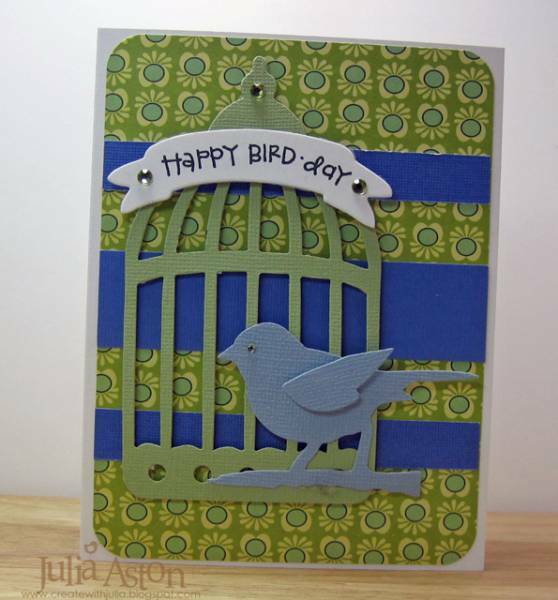 The stamps I used on the cards below were designed especially for Lisa by Claire over at Waltzingmouse. Lisa is putting together card kits that will include stamps, patterned papers, brads and chipboard shapes. This star and sentiment will be in one of the kits. 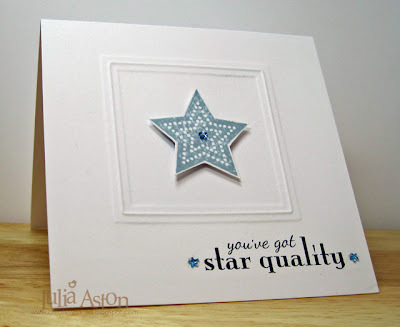 I embossed the Nestability square on the card, stamped the star on a scrap of white, cut it out and adhered it inside the square using foam tape. I stamped the sentiment on the card and added little star gems on the star and sentiments to finish it off! Very clean and simple! 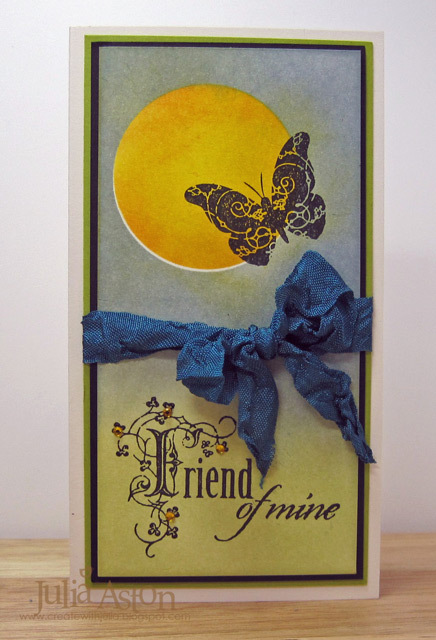 Another set in her kits is this lovely butterly and pretty vine sentiment. 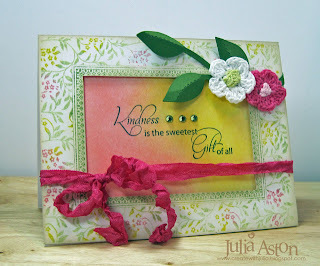 This time I dry embossed a Nestability rectangle and stamped the sentiment inside. Then I stamped the butterfly in 3 different colors, cut them out and adhered them around the frame with glue dots. I added tiny green gems to the vine and on the butterflies. 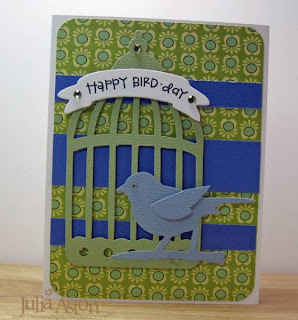 My final card was made for the Featured Stamper challenge over on Split Coast yesterday using the same stamps as above. I chose Mary Beth's Halloween Sunset card to CASE. I love masking and sponging so her card really spoke to me! I changed the colors and stamps used - having a butterfly instead of bats flying across the moon and I added a sentiment. I punched a circle in a piece of Eclipse tape, sponged the moon, took off the mask, placed the circle piece I had punched, over the moon and sponged the rest of the card. Then I stamped my butterfly and sentiment in black ink, added tiny gems and the wrinkled seam tape! I hope you will check out Lisa's new shop to see all the goodies she has to offer and check out The Crafts Meow blog too - you'll find a whole list of people showcasing her wonderful stamps today! thanks SO much for stopping by - I'd love to hear what you think of Lisa's new stamps! Ink: Memento Tuxedo Black, Ranger Distress Tattered Rose, Bundled Sage, Antique Linen, Scattered straw. Accessories: Rectangle Nestability, Tiny Gems - Taylored Expressions, glue dots. WMS Saturday Sketch - Bravo! 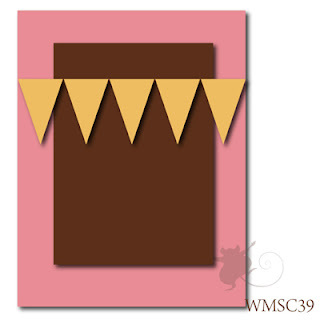 It just so happnens that Waltzingmouse released two banner stamp sets on March 1, Vintage Banners and Bitty Banners. I used stamps from Bitty Banners on my sketch card today. The bunting, the banner and the little star are all from Bitty Banners. My BRAVO! sentiment is from Fancy Phrases. 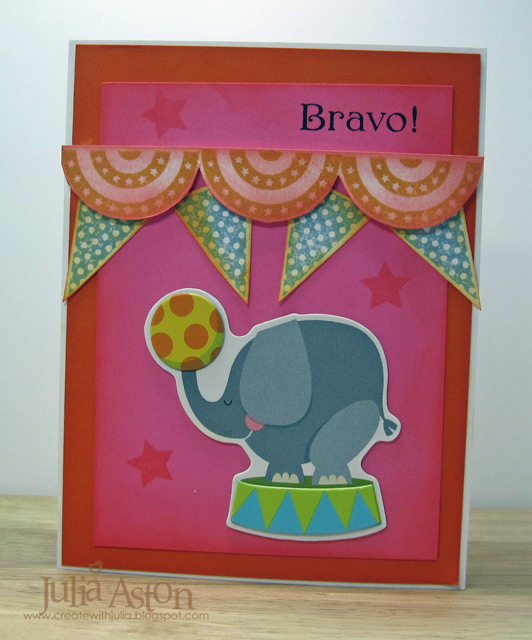 The cute little chipboard elephant is from a chipboard circus set called Kids from Michaels. Now go check out the WMS Sketch Blog and get inspired by the cards the Mischief Makers and other DT members have created using this week's sketch. Then make your own card using the sketch and link it on the Sketch Blog by Thursday 3/24/11 at 11:59 pm EST - you could be chosen Top Mouse !! Winners are announced each Saturday along with the new sketch challenge. 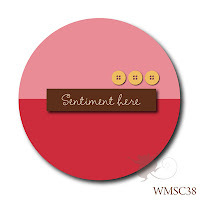 And every week one lucky entry will win a free WMS stamp set of choice!! Ink: Versafine Onyx Black, Ranger Distress - Weathered wood, Worn Lipstick, Wild Honey. Accessories: Chipboard sticker - Recollections Kids/Michaels, foam tape. 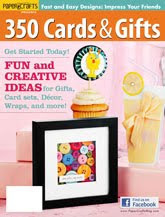 Have You Seen the PaperCrafts 350 Cards & Gifts?? Good golly! I'm SO excited to share with you that I've been published! 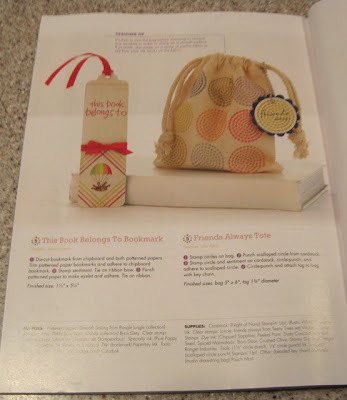 If you get a chance - check out your local craft shop for the PaperCrafts 350 Cards and Gifts publication. It's jam packed with all kinds of inspiring projects and cards! 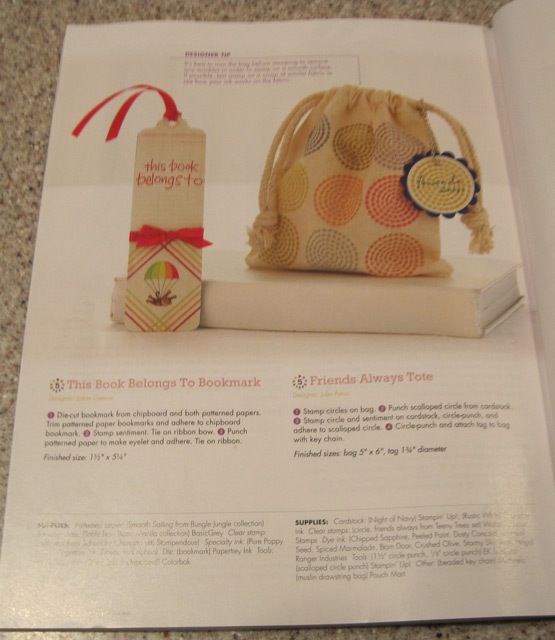 Under the Gifts Section , on page 142 you'll find my little stamped canvas bag. The stamps I used here are from Waltzingmouse Teeny Trees Set. 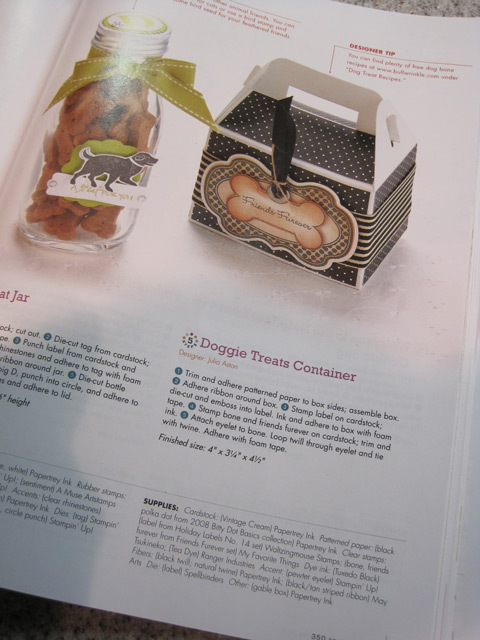 And under the Food Wraps section on page 107 you'll find my little Doggie Treats box. I even made my own little doggie milk bones to go inside! Check out the Bullwrinkle Web site under 'dog treat recipes' at the bottom of the page for lots of fun recipes. 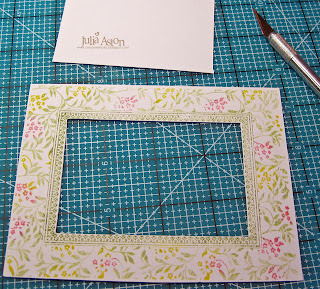 The Nestie Frame stamp is from Waltzingmouse - Holiday Labels No. 14, the dog bone and sentiment are from My Favorite Things - Friends Furever. Thanks for indulging me and sharing my excitement today! Hope you have a wonderful weekend - we're finally getting warmer sunny weather here in New England - all of our snow piles have finally melted! Ink: Ranger Distress Chipped Sapphire, Peeled Paint, Dusty Concord, Mustard Seed, Spiced Marmalane, barn Door, Crushed Olive, Stormy Sky, Rusty Hinge. 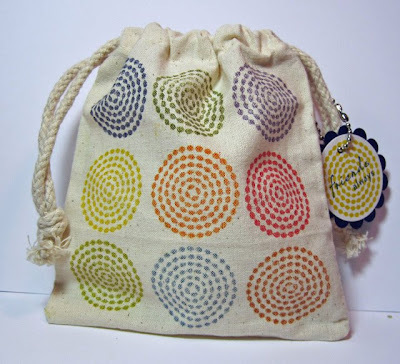 Accessories: circle punch & scalloped circle punch - SU, beaded key chain - Michaels, muslin drawstring bag - Pouch Mart. Ink: Memento Tuxedo Black, Ranger Distress Tea Dye. Happy St. Patrick's Day stamping friends! 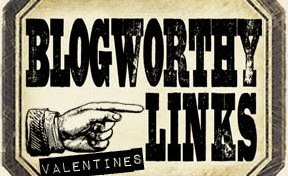 Today I'm participating in the Friends of Waltzingmouse Blog Waltz taking place in the Playroom of the WMS forum. You can check out all the details here. This month's theme is St. Patrick's Day/Irish. Since I don't need any more St. Patrick's Day cards for this year (!) 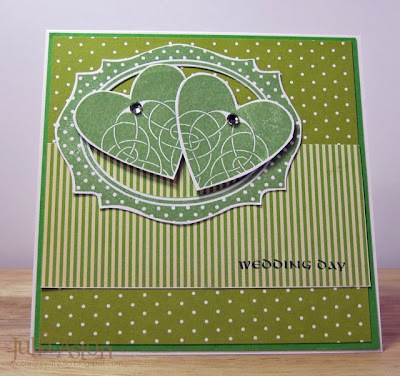 I decided to go with a Celtic Wedding card with all the appropriate green! 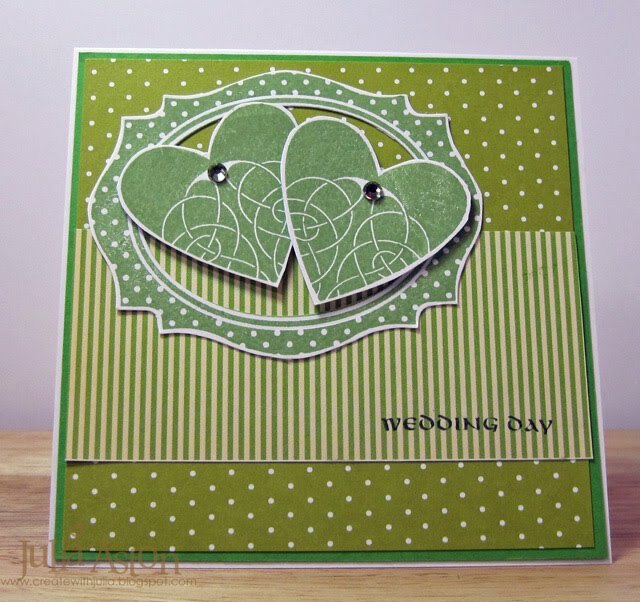 The lovely Celtic heart stamp and wedding day sentiment are from the Celtic Heritage set. The beautiful frame is from the new set Very Vintage Labels 18. I used an oval Nestability to cut out the center of it - and since I don't have the Labels 18 Nestabilities yet - I just cut along the outside edge with my scissors! This month there is a contest going on in the Playroom - post what your St. Paddy's day plans or memories are in the chat thread and a random entry will win a prize! There will also be a prize for one random card posting in the Waltz thread! 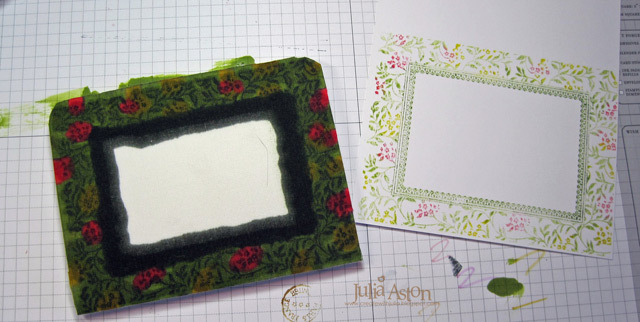 I'm also entering this into the Wee Memories Scrappy Saturday Challenge - to use green! Wishing the luck of the Irish to ye today!! Paper: White, New Leaf - PTI, DP Bitty Dots Basics -PTI, October Afternoon Modern Homemaker. Accessories: Oval nestabilities, Rhinestones - Kaiser, foam tape. Today is RUBBERNECKER STAMPS release day!! We are SO excited to share our NEW release with you that, we are celebrating with a BLOG HOP!! Speaking of celebrating, we are also giving away a PRIZE!!! If you HOP along with us today and leave some LOVE at EVERY stop along the way?? 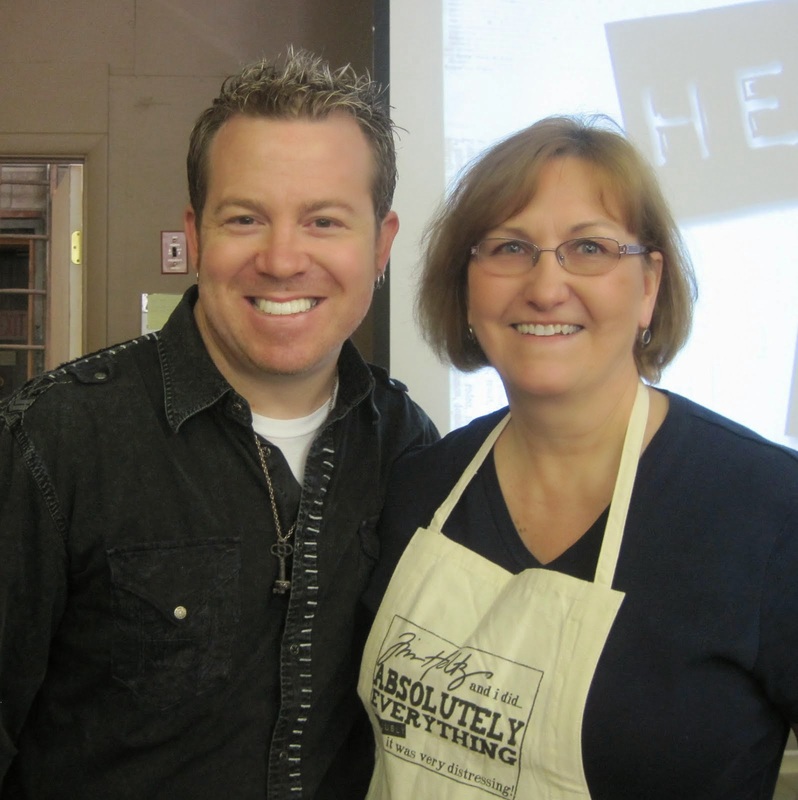 You will be entered for your chance to win……. A $50 GIFT CERTIFICATE for Rubbernecker Stamps!! How is that for a PRIZE?!! We will announce the winner THURSDAY on the Rubbernecker Blog! So, you have until then to HOP! The official BLOG HOP ROUTE is listed below, in case you should get lost!! Thanks for joining in our excitement and BEST OF LUCK!! Winners from the preview days are posted on the blog today so be sure to check it out! 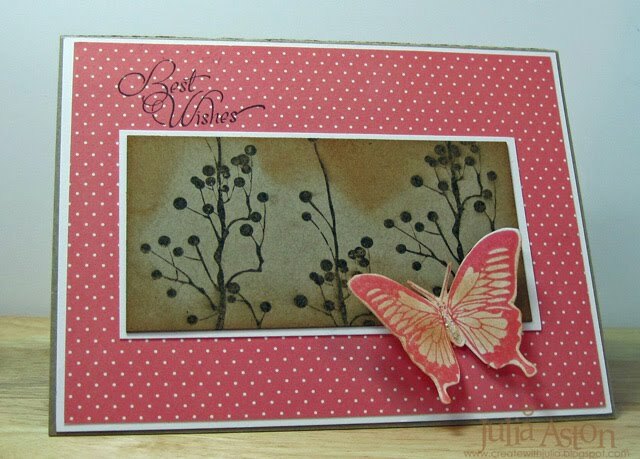 On this card I used two new sets - Bud Trees and Butterflies are Free. I only inked a piece of the sentiment here (Best Wishes) - the full sentiment is "Fluttering by with my Best Wishes". I stamped the bud trees on kraft, then sponged the edges with Ranger Tea Dye Ink. I stamped the butterfly on white, cut it out and then sponged it with the same ink. I layered it onto the card with a glue dot. I added a little Stickles to the center for a little shimmer! My sketch is from Chupa's Sketchbook Saturday Challenge . I'm also entering this in Delightful Sketches Challenge - to use Butterflies. 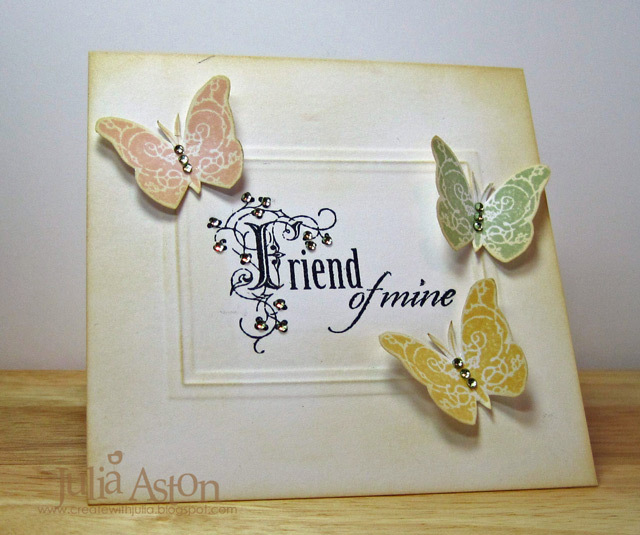 For my second card today I used a new flourish stamp (#530-14) and a sentiment from Butterflies are Free (#538). The colors are from today's Split Coast Color Challenge - Soft Suede, Baja Breeze and Crumb Cake. I will use this card as an Anniversary Card. You are now free to take your shopping list over to Rubbernecker and order up some Rubbah!! Design Team Be sure to leave a comment on each blog to increase your chances of winning! Julia Aston you are here! Accessories: glue dots, Crystal Ice Stickles. Paper: Tan Bazzill Basics, White - PTI, Baja Breeze - SU, DP Basic Grey Bittersweet Paper Pad. Ink: Ranger Distress Tea Dye & Brushed Corduroy, Versafine Onyx Black. Welcome friends to Day 2 of the Rubbernecker New Release Previews! Thank you so much for your kind comments on yesterdays post. I truly appreciate each and every one! 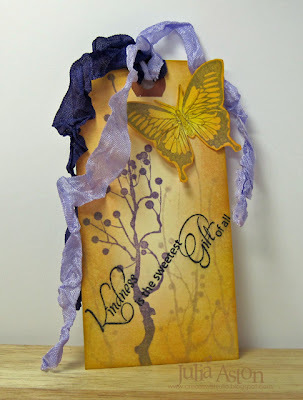 Today I have this pretty tag to show you that I made using two of the new sets - the funky trees and sentiment are from a set called Bud Trees and the beautiful butterfly is from Butterflies Are Free. Both available tomorrow 3/15! First I stamped the trees in two different colors - one dark, one light. Then I sponged all the edges with Ranger Distress Dried Marmelade Ink. I stamped the sentiment directly on the tag on a diagonal. Next I stamped the butterfly - cut it out and sponged it with Dried Marmelade ink. I added a little shimmer to it's body and wings with my Spica gold pen (not too obvious here in the pic). To finish off my tag I looped two pieces of wrinkled seam binding through the hole. This would make a wonderful book mark gift for a friend don't you think?? I'm entering this tag in the Delightful Challenges- to use butterflies. You will want to visit ALL of the FABULOUS design team today, and leave a comment at each for a chance to win a $25.oo Rubbernecker Stamps Gift Certificate! Check out the Rubbernecker Blog for all the deets and the list of the Design Team previewing cards today. Thanks for stopping by, enjoy all of our creations and GOOD LUCK! I hope you will stop by tomorrow for the New Release DT blog hop when all of these wonderful new Rubbernecker stamps will be available for you to purchase! Welcome friends to Day 1 of the Rubbernecker Previews! Several of the RN Design Team are highlighting some of the new stamps that Dave will be releasing on Tuesday 3/15. This lovely stamp is one of three new birds on branches - this one is (obviously) Bird in Cherry Tree ! (#529-10). I inked the stamp with green and red ink, cut it with a petite oval nestie and sponged it before taking it out of the die. I added ice stickles to the cherries to add a little shimmer (which you can't really see the loveliness of in my pic :( unfortunately) and a small gem to the birds eye. I ran my green ink over the narrow white silk ribbon so the buttons would resemble cherries with green stems (in an artistic sort of way LOL!!). You will want to visit ALL of the FABULOUS design team posting today, for on one of our blogs is a chance to win a $25.oo Rubbernecker Stamps Gift Certificate! You will find the list of all the Design Team members showing previews today on the Rubbernecker Blog! Thanks for stopping by, enjoy all of our creations and GOOD LUCK! Hope to see you tomorrow for Day 2 (there will be another prize to win!)! Paper: White - PTI, green - Coredinations, DP October Afternoon Modern Homemaker. Ink: Ranger Distress Weathered Wood, Versafine Onyx Black, Memento Bamboo Leaves & Lady Bug. Happy Saturday dear friends! Today Waltzingmouse has a wonderful round sketch for us to play with - I LOVE making round cards - do you?!? 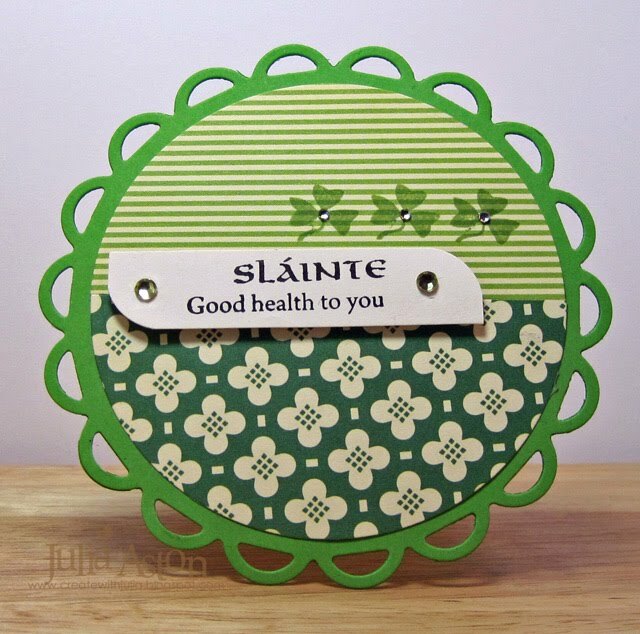 I had a lot of 'green stuff' out on my work table having recently made a few St. Patrick's Day cards to send to friends as well as making something for the Friends of WMS blog waltz on 3/17 where the theme is St. Pat's or Irish! I used my circle and lacey circle Nestabilities and some pretty papers from October Afternoon. My stamps are from Irish Blessings. This card could be for St. Patrick's Day or used as a get well card! 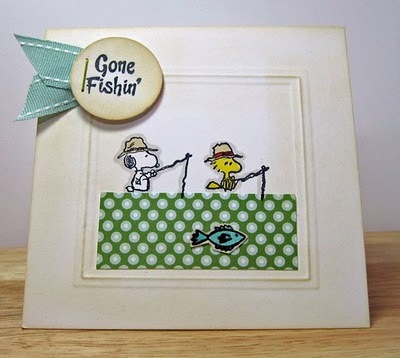 Then make your own card using the sketch and link it on the Sketch Blog by Thursday 3/17/11 at 11:59 pm EST - you could be chosen Top Mouse !! Winners are announced each Saturday along with the new sketch challenge. 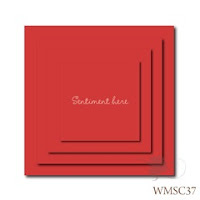 And every week one lucky entry will win a free WMS stamp set of choice!! whoo hoo! This also qualifies for the Friday's Stamp Something Challenge - to use cream and green and The Shabby Tea Rooms challenge - the luck of the Irish, and the StampinSanity Holy guacamole challenge. 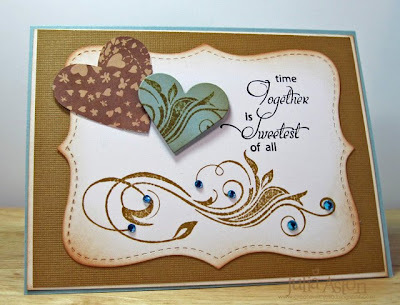 Hope you can stop by tomorrow for my preview of new Rubbernecker stamps being released on Tuesday 3/15! Accessories: Circle and Lacey Circle Nestabilities, Corner Rounder, Tiny Gems - Taylored Expressions, Rhinestones - Kaiser, quickie glue pen, foam tape. Pansies are one of my favorite flowers with their sweet little 'faces' and beautiful colors - every spring they are one of the first flowers I plant in my garden. I made this card to help Karen Barber illustrate her color challenge over at Split Coast this week. 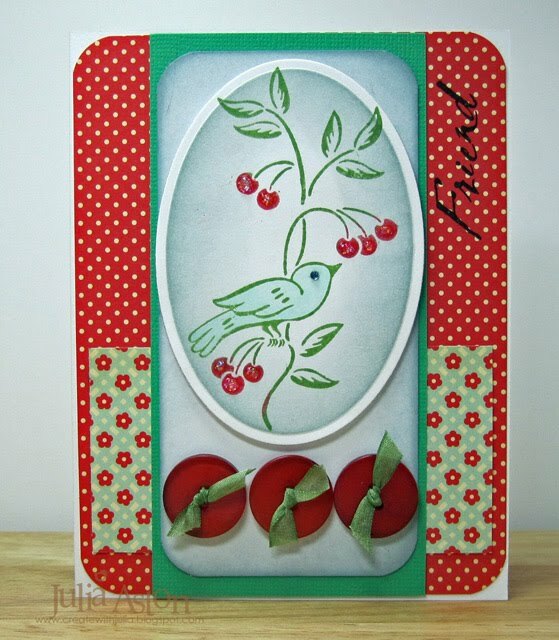 She chose Pear Pizzazz, Concord Crush and Bashful Blue for us to use, a lovely combination don't you think? Her dessert option was to use a white gel pen on our creation. 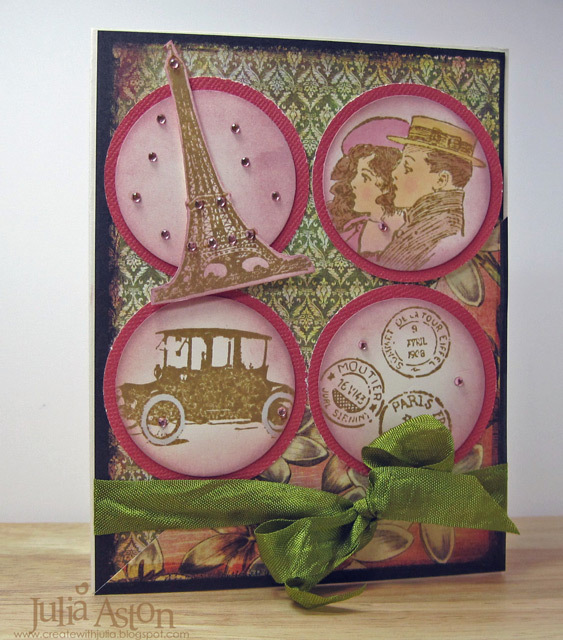 For my card, I first dry embossed a deckled oval Nestability in the center of the card. I used copics in colors similar to the three challenge colors for my cluster of pansies. I cut out the image and adhered it inside the frame with foam tape. 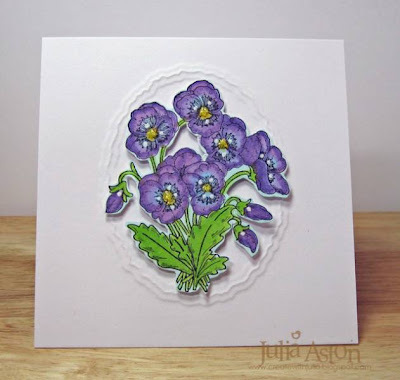 Finally, I added yellow stickles to the center of my pansies and some dots with a white gel pen. This week the Split Coast teaparty honored Roxie our long suffering SCS Sketch Challenge hostess! We all headed off to the Roxbury for a wild night of dancing! I'm bringing a rather sedate victorian couple to add a little class to the evening (if that's at all possible!! LOL!!!) but boy can they 'cut a rug' - look at those pointed toes and uplifted elbows! This lovely image came from Dover Publications who publishes copyright free images on disk that you can download, resize and print to your heart's content! I added some ice stickles to the ladies hair ribbon, shoulder and edge of her dress and a little to the man's waistcoat for some shimmer. Hope you can stop by on Sunday - all of the Rubbernecker DT will be previewing some brand new stamps being released on Tuesday 3/15. 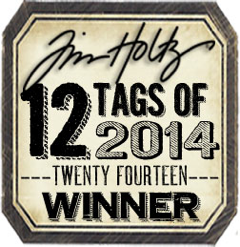 There will be a chance to win free Rubbernecker stamps - whoo hoo!! and check out the newly refurbished Rubbernecker Blog! Confused by the title and the image?!! I combined both Monday Split Coast challenges in my card today. 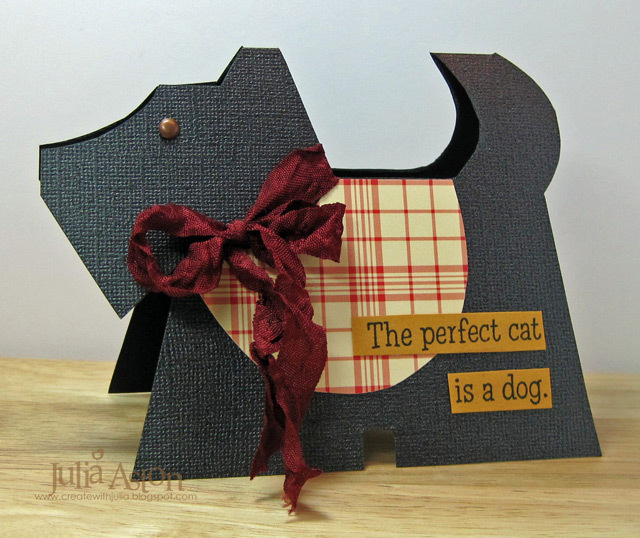 The CAS challenge was to use humor - the Try a New Techinque challenge was to use a different shape for your card. I found this cute little scottie dog template in Papercrafts Magazine on line. Isn't he just adorable?! I cut the dog out of a textured Bazzill paper, added his little jacket, stamped the sentiment, cut it out and tied a bow around his neck! The sentiment is from Rubbernecker. I used to be just a dog person - we had a sweet cocker-springer spaniel mix dog growing up and later I had the most wonderful great dane, but years later someone gave me a little homeless kitty and I became a cat lover too. Scout always sits with me when I stamp - so I had to explain to her that I really didn't mean what I stamped on the card ....... LOL!! 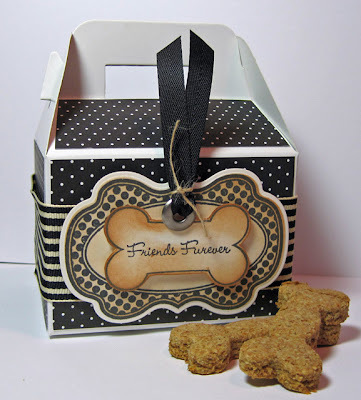 This sweet little pup will fit in a regular size envelope in case you're wondering! Lucky to Have You - Friend! Hello dear friends! Welcome to the start of another week! I made these two cards for the Inspiration Challenge over on Split Coast this weekend. 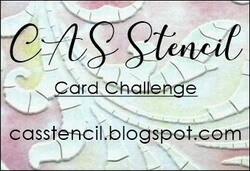 I used a free digi stamp and sentiment from PaperSmooches on my card. 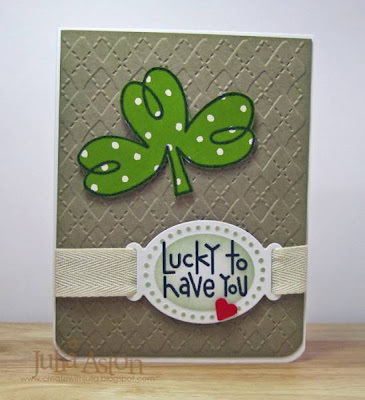 I embossed the background with Argyle embossing folder and cut out the sentiment with a nestie tag die. 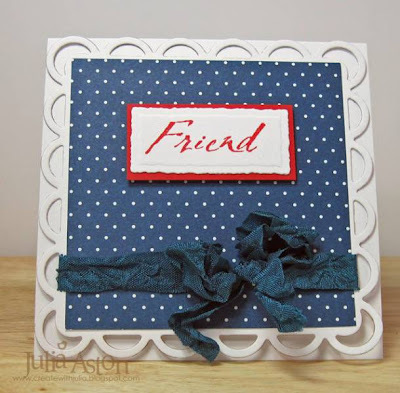 This card also works for The Ways to Use it Challenge this week - to use polka dots and the Free 4 All challenge -show your luck! We finally had some really warm weather this weekend (50's) and lots of our snow melted (finally!) I can actually see some soggy lawn as well as all the branches that had fallen during the snow storms we had all winter that got covered in the snow - now exposed!! Lots of clean up to be done this spring! Welcome once again dear friends, to the Saturday Waltzingmouse Sketch! How fun is this to play with??!! I just couldn't put down the new western stamp sets after working with them for the sneak peeks! Don't you just LOVE this blanket background stamp! Mwahh- it stamps so nicely!!! It's from Way Out West and the funky cowboy get well sentiment is from Back In the Saddle. 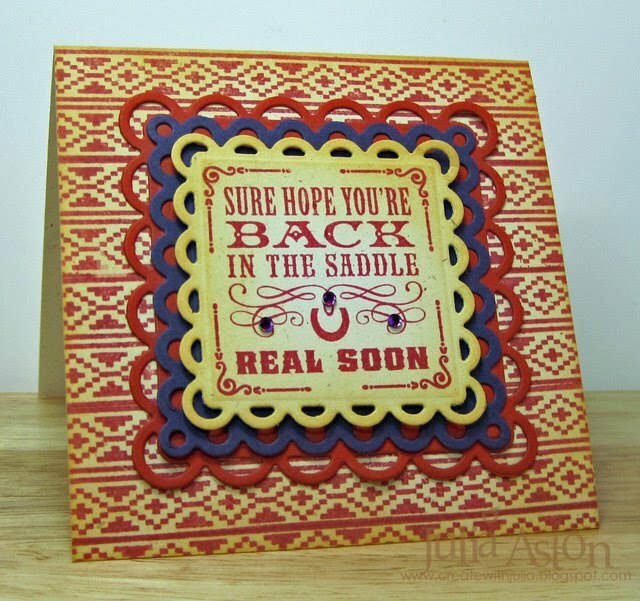 I sponged the edges of the card and the sentiment with Scattered Straw Ranger Distress Ink and layered the sentiment on Lacey and Eyelet Square Nestabilities. To top it off - I added 3 little purple gems for a little sparkle! Then make your own card using the sketch and link it on the Sketch Blog by Thursday 3/10/11 at 11:59 pm EST - you could be chosen Top Mouse !! Kent and I are off to the Melrose Symphony tonight - hope you have some fun plans too?! Accessories: Gems - Creative Charms, Lacey & Eyelet Squares Nestabilities, foam tape.